Editors' Picks: 20 of the Best Things to Do in the State of Washington! The state of Washington is home to Starbucks, Amazon and Microsoft. It's the birthplace of Jimi Hendrix, Bing Crosby and '90s grunge music. Washington is the only state named for a U.S. president, and officially entered the union in 1889 as the 42nd state. It's famous for its apples, its mountain ranges - and copious amounts of rainfall (the most it received in a single day was a bit over 14 inches in 1986). A unique blend of natural beauty (52 percent of the state is forest) creativity and innovation, Washington is a fascinating place. There are so many things to do and see, but here's our list of the 20 coolest things to do in the Evergreen State. Artist Dale Chihuly has created an amazing variety of stunning glass works that are displayed in an eight-room exhibition hall. Whimsical, beautiful and colorful, they're worth seeing during the day - or at night, when they're illuminated. It's located right by the Space Needle. It's one of the most distinctive features of the Washington landscape. There are numerous hiking trails, suitable for all levels. The wildflower hikes in spring are especially breathtaking. Built for the 1962 World's Fair, this iconic observation tower provides some of the best views of Seattle, surrounding mountains and islands off the coast. Elevators whisk you to the top in just 41 seconds, and you can enjoy coffee as you take in the 360-degree view. This fabulous museum honors America's love affair with the automobile. From some of the earliest cars, through muscle cars, sports cars and everything in between, it's a fun way to spend a rainy spring afternoon. 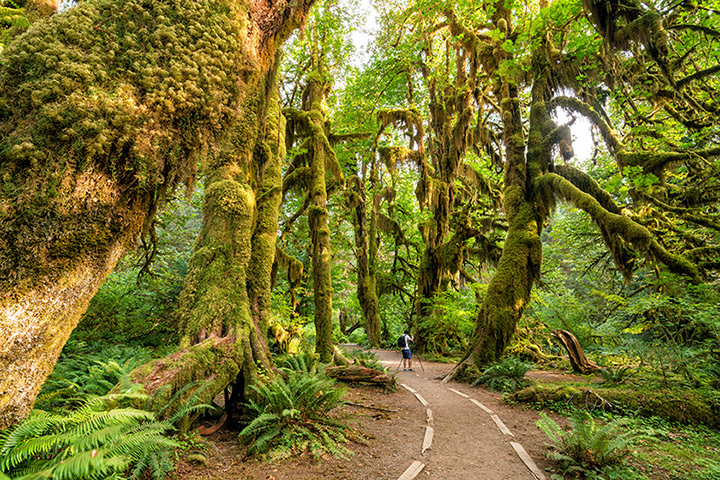 It's worth taking a drive around this gorgeous park, for the variety of scenery: from the Hoh Rain Forest, to the waterfalls of Sol Duc Hot Springs, to dozens of beaches. That's just for starters. There are plenty of places to hike, as well. The Boeing factory holds the distinction of being the world's largest building. You can take a gander at it-and planes in various states of assembly-with their popular Future of Flight tour. These islands dotting Puget Sound are easily accessible via ferry. You can spend the day exploring art galleries, great restaurants and more - and even spot a whale or two from the shore. It's known for its epic 1980 explosion, which reduced the peak by 1,300 feet. You need a permit to hike the area, but can get a good look inside the crater via the Johnston Ridge Observatory. The lush flowerbeds of this popular small garden in Manito Park really pop during the summer. Relax by the waterfall and koi pond - you'll feel instantly more chill. The area is considered the Lavender Capital of America, and this annual July event allows you to visit some heavenly gardens. Beautiful - and they smell pretty darn good, too. This Puget Sound island is a hot destination for wine tasting. Take a short ferry ride from Seattle and some great tasting rooms. There are also fantastic restaurants to offset the buzz. Washington state is famous for its apples (in fact, the apple is the official state fruit) - and there are no shortage of orchards to visit. If you're not into picking your own, you can always enjoy fresh cider (hard and otherwise), or just enjoy some spectacular views. For over a century, this quirky souvenir shop has been an attraction on Seattle's waterfront. It features things you'll find nowhere else, lots of fun things to look at (like the mummies) and do (like a penny press). Fans of the offbeat '90s TV show will want to stop into the Salish Lodge & Spa in Snoqualmie, which served as a filming location. Then toddle up the road a bit to Twede's Café in North Bend, which played the role of the "Double R Diner." Have a slice of cherry pie while you're there. Since 1964, the Washington State Autumn Leaf Festival has celebrated the fall colors with a Bavarian theme, parade and more family-friendly activities. The Campbells were a prominent family in the Spokane of the early 20th century. Their home is now a museum that gives visitors a taste of life during that era. During the holiday season, things get turned up a notch with elaborate period decorations, actor portrayals - and activities, like baking Christmas cookies with the house chef. Palouse Falls is Washington's official state waterfall (and they had a lot to choose from). The 198-foot cascade is breathtaking at any time of year, but when it freezes over, it's really something to see. Since 1949, the Argosy Christmas Ship Cruise has been a holiday tradition. It sails to various waterfront communities on Puget Sound. Bonfires are lit on shore in anticipation of its arrival. On board, there's plenty of seasonal music and activities. About 100,000 snow geese travel thousands of miles to Port Susan Bay, ostensibly to avoid the bitter temperatures of the Arctic. This annual event is celebrated each February with the Port Susan Snow Goose and Birding Festival, where you can participate in various birdwatching events, seminars, tours and more. The city of Leavenworth has modeled itself as a real-life Bavarian village. It becomes most popular in the winter, with its Ice Festival. There are live ice carvings with chainsaws, a snowmobile sled pull, ice fishing, snow sculpture contests and more.